Collector Office Malda is ready to hire the applicants for the 02 available seats of Data Entry Operator Jobs as per the Collector Office Malda Recruitment 2017 advertisement published on department web portal. Job seekers who have required eligibility may apply through Offline Mode after reading all the details of Collector Office Malda Recruitment 2017 through this section.You are needed to send the application form in the appropriate format at the below address till or before 3rd March 2017. Education Needed : Candidates who are willing to apply for Collector Office Malda jobs must posses Graduation Degree from any recognized board or institution. Reserved category applicants will get the age relaxation as per Collector Office Malda norms. Emoluments given to Employee: Contenders who will be appointed successfully for Collector Office Malda Vacancy, they get the salary pay band of Rs. 11,000/- as per organization norms. Selection of the job hunters will be done on the basis of their performance in the Written Exam, Personal Interview, Computer Test conducted by the selection committee. Deadline for Receiving Hard Copy of Application Form Is : 03-03-2017. Click Here For Collector Office Malda Official Notification Link. Bihar State Tourism Development Corporation is ready to hire the applicants for the 20 available seats of Clerk, Manager, Engineer Jobs as per the BSTDC Recruitment 2017 advertisement published on department web portal. Job seekers who have required eligibility may apply through Offline Mode after reading all the details of BSTDC Recruitment 2017 through this section.You are needed to send the application form in the appropriate format at the below address till or before 17th March 2017. Education Needed : Candidates who are willing to apply for BSTDC jobs must posses Graduation Degree / Post Graduation Degree from any recognized board or institution. Reserved category applicants will get the age relaxation as per BSTDC norms. Emoluments given to Employee: Contenders who will be appointed successfully for BSTDC Vacancy, they get the salary pay band of Rs. 45,000 - 50,000/- (Post 1), Rs. 40,000 - 50,000/- (Post 2-5,7,8), Rs. 50,000 - 65,000/- (Post 6), Rs. 25,000 - 30,000/- (Post 9,10,12), Rs. 35,000 - 45,000/- (Post 11), Rs. 20,000 - 25,000/- (Post 13) as per organization norms. Last Date of Receipt of Applications : 17-03-2017. Click Here For BSTDC Official Notification Link. Junior Leaders Academy is ready to hire the applicants for the 38 available seats of Messenger, Stenographer, Clerk Jobs as per the Junior Leaders Academy Recruitment 2017 advertisement published on department web portal. Job seekers who have required eligibility may apply through Offline Mode after reading all the details of Junior Leaders Academy Recruitment 2017 through this section.You are needed to send the application form in the appropriate format at the below address till or before With in 45 Day's. Education Needed : Candidates who are willing to apply for Junior Leaders Academy jobs must posses 10th / 12th from any recognized board or institution. The candidates who wish to apply for the available vacancy should be existing between 18 - 25 Years (Post 1-7,12-14), 18 - 27 Years (Post 8-11). Reserved category applicants will get the age relaxation as per Junior Leaders Academy norms. Emoluments given to Employee: Contenders who will be appointed successfully for Junior Leaders Academy Vacancy, they get the salary pay band of Rs. 5,200 - 20,200/- plus 1800/1900/- Grade Pay as per organization norms. Deadline to Submit the Application Is : With in 45 Day's. Deadline to Submit the Application Is (Remote areas / Flung Areas) : With in 52 Day's. Click Here For Junior Leaders Academy Official Notification Link. Lal Bahadur Shastri Hospital is ready to hire the applicants for the 04 available seats of Senior Resident Jobs as per the Lal Bahadur Shastri Hospital Recruitment 2017 advertisement published on department web portal. Job seekers who have required eligibility may apply after reading all the details of Lal Bahadur Shastri Hospital Recruitment 2017 through this section.Candidates who have decided to build their career in this organization they can attend Walkin Interview which are going to be held On 27th February 2017. Education Needed : Candidates who are willing to apply for Lal Bahadur Shastri Hospital jobs must posses Post Graduation Degree / Diploma (Respective streams) from any recognized board or institution. The candidates who wish to apply for the available vacancy should not be more than 40 Years As On 31-12-2016. Reserved category applicants will get the age relaxation as per Lal Bahadur Shastri Hospital norms. Click Here For Lal Bahadur Shastri Hospital Official Notification Link. Chaudhary Bansi Lal University Haryana is ready to hire the applicants for the 08 available seats of Assistant Jobs as per the CBLU Haryana Recruitment 2017 advertisement published on department web portal. Job seekers who have required eligibility may apply through Online Mode after reading all the details of CBLU Haryana Recruitment 2017 through this section.Candidates who meet the eligibility criteria and interested to apply they can submit their application form before the last date that is 20th March 2017. Education Needed : Candidates who are willing to apply for CBLU Haryana jobs must posses Graduation Degree from any recognized board or institution. Those aspirants who are belonging to General/ OBC Category & interested to apply for above posts they need to be paid Processing fee of 400/-. Job hunters belonging to SC/ BC/ EBPG Only Haryana Category & interested to apply for above posts they need to be paid Processing fee of 100/-. Job hunters belonging to Ex-s/ PWD (Persons with Disability) Category are exempted from such payment of processing fee. The candidates who wish to apply for the available vacancy should be existing between 18 - 50 Years. Reserved category applicants will get the age relaxation as per CBLU Haryana norms. Emoluments given to Employee: Contenders who will be appointed successfully for CBLU Haryana Vacancy, they get the salary pay band of Rs. 9,300 - 34,800/- plus Grade Pay of Rs. 3600/-. as per organization norms. Selection of the job hunters will be done on the basis of their performance in the Tests, Personal Interview conducted by the selection committee. Opening Date of Online Registration of Application Form Is : 16-03-2017. Dead Line of Online Application Is : 20-03-2017. Closing Date to Submit Hard Copy of Application Form Is : 27-03-2017. Click Here For CBLU Haryana Official Notification Link. Uttar Pradesh Jal Nigam is ready to hire the applicants for the 383 available seats of Clerk, Stenographer Jobs as per the UPJN Recruitment 2017 advertisement published on department web portal. Job seekers who have required eligibility may apply through Online Mode after reading all the details of UPJN Recruitment 2017 through this section.Candidates who meet the eligibility criteria and interested to apply they can submit their application form before the last date that is 28th February 2017. Education Needed : Candidates who are willing to apply for UPJN jobs must posses 12th / Diploma / Graduation Degree from any recognized board or institution. Job hunters belonging to SC/ ST Category & interested to apply for above posts they need to be paid Processing fee of 300/-. The candidates who wish to apply for the available vacancy should be existing between 18 - 40 Years As On 01-08-2016. Reserved category applicants will get the age relaxation as per UPJN norms. Emoluments given to Employee: Contenders who will be appointed successfully for UPJN Vacancy, they get the salary pay band of Rs. 5,200 - 20,200/- plus 1900/2800/- Grade Pay as per organization norms. Opening Date of Online Registration of Application Form Is : 23-02-2017. Last Date of On-line registration : 28-02-2017. Click Here For UPJN Official Notification Link. Palghar Police Department is ready to hire the applicants for the 159 available seats of Constable Jobs as per the Palghar Police Department Recruitment 2017 advertisement published on department web portal. Job seekers who have required eligibility may apply through Online Mode after reading all the details of Palghar Police Department Recruitment 2017 through this section.Candidates who meet the eligibility criteria and interested to apply they can submit their application form before the last date that is 17th March 2017. Education Needed : Candidates who are willing to apply for Palghar Police Department jobs must posses 10th / 12th from any recognized board or institution. Those aspirants who are belonging to Unreserved Category & interested to apply for above posts they need to be paid Processing fee of 350/-. Job hunters belonging to Reserved Category & interested to apply for above posts they need to be paid Processing fee of 200/-. Job hunters belonging to Ex-s Category & interested to apply for above posts they need to be paid Processing fee of 50/-. The candidates who wish to apply for the available vacancy should be existing between 18 - 28 Years. Reserved category applicants will get the age relaxation as per Palghar Police Department norms. Emoluments given to Employee: Contenders who will be appointed successfully for Palghar Police Department Vacancy, they get the salary pay band of Rs. 5,200 - 20,200/- plus Grade Pay of Rs. 2000/- + Rs. 500/-. as per organization norms. Selection of the job hunters will be done on the basis of their performance in the Written Exam, Personal Interview, Physical Measurement Test, Physical Endurance Test conducted by the selection committee. Starting Date of Online Submission of Application Form Is : 24-02-2017. Online Application Will Be Received Till : 17-03-2017. Click Here For Palghar Police Department Official Notification Link. Kendriya Vidyalaya Air Force Station is ready to hire the applicants for the 27 available seats of Data Entry Operator, Staff Nurse, PGT Jobs as per the KVAFS Recruitment 2017 advertisement published on department web portal. Job seekers who have required eligibility may apply through Offline Mode after reading all the details of KVAFS Recruitment 2017 through this section.You are needed to send the application form in the appropriate format at the below address till or before 1st March 2017. Education Needed : Candidates who are willing to apply for KVAFS jobs must posses Graduation Degree / Engineering Degree / Post Graduation Degree from any recognized board or institution. The candidates who wish to apply for the available vacancy should be existing between 18 - 65 Years. Reserved category applicants will get the age relaxation as per KVAFS norms. Last Date to Submit Filled-In Application : 01-03-2017. Click Here For KVAFS Official Notification Link. Lakshmibai National Institute Of Physical Education is ready to hire the applicants for the 49 available seats of Clerk, Registrar, Professor Jobs as per the LNIPE Recruitment 2017 advertisement published on department web portal. Job seekers who have required eligibility may apply through Offline Mode after reading all the details of LNIPE Recruitment 2017 through this section.You are needed to send the application form in the appropriate format at the below address till or before 31st March 2017. Education Needed : Candidates who are willing to apply for LNIPE jobs must posses 10th / 12th / ITI / Diploma / Graduation Degree / Post Graduation Degree from any recognized board or institution. The candidates who wish to apply for the available vacancy should not be more than 30 Years (Post 8), 27 Years (Post 9-14). Reserved category applicants will get the age relaxation as per LNIPE norms. Emoluments given to Employee: Contenders who will be appointed successfully for LNIPE Vacancy, they get the salary pay band of Rs. 37,400 - 67,000/- plus 10,000/9000/- Grade Pay (Post 1-4), Rs. 15,600 - 39,100/- plus 6000/5400/7600/- Grade Pay (Post 5-7), Rs. 9300 - 34,800/- plus 4200/- (Post 8), Rs. 5200 - 20,200/- plus 2400/1900/1800/- Grade Pay (Post 9-14) as per organization norms. Last Date of Receipt of Applications : 31-03-2017. Click Here For LNIPE Official Notification Link. Click Here To Apply 1. Center of Innovative and Applied Bioprocessing is ready to hire the applicants for the Various available seats of Project Fellow, Research Fellow Jobs as per the CIAB Recruitment 2017 advertisement published on department web portal. Job seekers who have required eligibility may apply after reading all the details of CIAB Recruitment 2017 through this section.Candidates who have decided to build their career in this organization they can attend Walkin Interview which are going to be held On 8th March 2017. Education Needed : Candidates who are willing to apply for CIAB jobs must posses Engineering Degree / Post Graduation Degree from any recognized board or institution. Reserved category applicants will get the age relaxation as per CIAB norms. Emoluments given to Employee: Contenders who will be appointed successfully for CIAB Vacancy, they get the salary pay band of Rs. 16,000/- (Project Fellow) as per organization norms. Walk in Interview Held On : 08-03-2017. Click Here For CIAB Official Notification Link. Thane Police is ready to hire the applicants for the 273 available seats of Constable Jobs as per the Thane Police Recruitment 2017 advertisement published on department web portal. Job seekers who have required eligibility may apply through Online Mode after reading all the details of Thane Police Recruitment 2017 through this section.Candidates who meet the eligibility criteria and interested to apply they can submit their application form before the last date that is 17th March 2017. Education Needed : Candidates who are willing to apply for Thane Police jobs must posses 12th from any recognized board or institution. The candidates who wish to apply for the available vacancy should be existing between 18 - 28 Years As On 31-03-2017. Reserved category applicants will get the age relaxation as per Thane Police norms. Emoluments given to Employee: Contenders who will be appointed successfully for Thane Police Vacancy, they get the salary pay band of Rs. 5,200 - 20,200/- plus 2000/- Grade Pay as per organization norms. Selection of the job hunters will be done on the basis of their performance in the Written Exam, Physical Test conducted by the selection committee. Starting Date of Online Application Form Filling Is : 24-02-2017. Last Date of On-line registration : 17-03-2017. Click Here For Thane Police Official Notification Link. Madhya Pradesh State Electronics Development Corporation Ltd. is ready to hire the applicants for the Various available seats of Chief General Manager Jobs as per the MPSEDC Limited Recruitment 2017 advertisement published on department web portal. Job seekers who have required eligibility may apply after reading all the details of MPSEDC Limited Recruitment 2017 through this section.Candidates who meet the eligibility criteria and interested to apply they can send their soft copy of application form through Email before the last date that is 9th March 2017. Organization Name: Madhya Pradesh State Electronics Development Corporation Ltd.
Education Needed : Candidates who are willing to apply for MPSEDC Limited jobs must posses Engineering Degree from any recognized board or institution. Reserved category applicants will get the age relaxation as per MPSEDC Limited norms. Emoluments given to Employee: Contenders who will be appointed successfully for MPSEDC Limited Vacancy, they get the salary pay band of Rs. 37,400 - 67,000/- plus Grade Pay of Rs. 8900/-. as per organization norms. Click Here For MPSEDC Limited Official Notification Link. Central Cottage Industries Corporation of India Limited is ready to hire the applicants for the 04 available seats of Manager Jobs as per the CCIC Recruitment 2017 advertisement published on department web portal. Job seekers who have required eligibility may apply through Online Mode after reading all the details of CCIC Recruitment 2017 through this section.Candidates who meet the eligibility criteria and interested to apply they can submit their application form before the last date that is 18th March 2017. Education Needed : Candidates who are willing to apply for CCIC jobs must posses Diploma / Graduation Degree / Post Graduation Degree from any recognized board or institution. The candidates who wish to apply for the available vacancy should not be more than 35 Years (Post 1), 45 Years (Post 2). Reserved category applicants will get the age relaxation as per CCIC norms. Emoluments given to Employee: Contenders who will be appointed successfully for CCIC Vacancy, they get the salary pay band of Rs. 20,600 - 46,500/- (Post 1), Rs. 29,100 - 54,500/- (Post 2) as per organization norms. Last Date For Apply Online : 18-03-2017. Click Here For CCIC Official Notification Link 1. Click Here For CCIC Official Notification Link 2. District Court Kullu is ready to hire the applicants for the 01 available seats of Oath Commissioner Jobs as per the District Court Kullu Recruitment 2017 advertisement published on department web portal. Job seekers who have required eligibility may apply through Offline Mode after reading all the details of District Court Kullu Recruitment 2017 through this section.You are needed to send the application form in the appropriate format at the below address till or before 7th March 2017. Education Needed : Candidates who are willing to apply for District Court Kullu jobs must read official notification for post wise qualification. Reserved category applicants will get the age relaxation as per District Court Kullu norms. Last Date to Submit Hard Copy of Application Form Is : 07-03-2017. Click Here For District Court Kullu Official Notification Link. 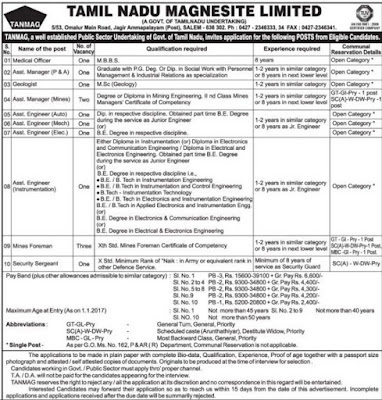 Tamilnadu Magnesite Limited is ready to hire the applicants for the 13 available seats of Medical Officer, Manager, Engineer Jobs as per the TANMAG Recruitment 2017 advertisement published on department web portal. Job seekers who have required eligibility may apply through Offline Mode after reading all the details of TANMAG Recruitment 2017 through this section.You are needed to send the application form in the appropriate format at the below address till or before 8th March 2017. Education Needed : Candidates who are willing to apply for TANMAG jobs must posses 10th / Diploma / Graduation Degree / Post Graduation Degree (MBBS) from any recognized board or institution. The candidates who wish to apply for the available vacancy should not be more than 45 Years (Post 1), 40 Years (Post 2-9), 50 Years (Post 10). Reserved category applicants will get the age relaxation as per TANMAG norms. Emoluments given to Employee: Contenders who will be appointed successfully for TANMAG Vacancy, they get the salary pay band of Rs. 15,600 - 39,100/- plus 6600/- Grade Pay (Post 1), Rs. 9,300 - 34,800/- plus 4400/4200/- Grade Pay (Post 2-9), Rs. 5,200 - 20,800/- plus 2400/- Grade Pay (Post 10) as per organization norms. End Date To Submit Hard Copy of Application Form Is : 08-03-2017. Jaipur Metro Rail Corporation Limited is ready to hire the applicants for the 45 available seats of Station Controller, Engineer, Maintainer Jobs as per the JMRC Recruitment 2017 advertisement published on department web portal. Job seekers who have required eligibility may apply through Online Mode after reading all the details of JMRC Recruitment 2017 through this section.Candidates who meet the eligibility criteria and interested to apply they can submit their application form before the last date that is 31st March 2017. Education Needed : Candidates who are willing to apply for JMRC jobs must posses ITI / Diploma / Graduation Degree / Engineering Degree from any recognized board or institution. Those aspirants who are belonging to Non-Creamy Layer OBC/ BC/ SBC Category & interested to apply for above posts they need to be paid Processing fee of 400/-. Job hunters belonging to SC/ST/PH (OL-R or L) of Rajasthan Category & interested to apply for above posts they need to be paid Processing fee of 250/-. The candidates who wish to apply for the available vacancy should be existing between 21 - 38 Years (18 years for the post of Maintainers) As On 01-07-2018. Reserved category applicants will get the age relaxation as per JMRC norms. Emoluments given to Employee: Contenders who will be appointed successfully for JMRC Vacancy, they get the salary pay band of Rs. 9,300 - 34,800/- (Post 1-6), Rs. 5,200 - 20,200/- (Post 7-9) plus Grade Pay of Rs. 3600/- (Post 1-6), Rs. 2800/- (Post 7), Rs. 2400/- (Post 8-9). as per organization norms. Selection of the job hunters will be done on the basis of their performance in the Examination, Personal Interview conducted by the selection committee. Online Registration Would Be Open From : 22-02-2017. Deadline for Submitting Online Application Form Is : 31-03-2017. Click Here For JMRC Official Notification Link. Department of Municipal Affairs is ready to hire the applicants for the 07 available seats of Accountant, Clerk, Helper Jobs as per the Department of Municipal Affairs Recruitment 2017 advertisement published on department web portal. Job seekers who have required eligibility may apply through Offline Mode after reading all the details of Department of Municipal Affairs Recruitment 2017 through this section.You are needed to send the application form in the appropriate format at the below address till or before 14th March 2017. Education Needed : Candidates who are willing to apply for Department of Municipal Affairs jobs must posses 8th / 10th / Graduation Degree from any recognized board or institution. Reserved category applicants will get the age relaxation as per Department of Municipal Affairs norms. Emoluments given to Employee: Contenders who will be appointed successfully for Department of Municipal Affairs Vacancy, they get the salary pay band of Rs. 7,100 - 37,600/- plus 3600/- Grade Pay (Post 1), Rs. 5,400 - 25,200/- plus 2600/- Grade Pay (Post 2), Rs. 4,900 - 16,200/- plus 1700/- Grade Pay (Post 3,4). as per organization norms. Deadline for Receiving Hard Copy of Application Form Is : 14-03-2017. Click Here For Department of Municipal Affairs Official Notification Link. Directorate of Medical Health & Family Welfare Society is ready to hire the applicants for the 411 available seats of Psychiatrist, Nurse, Clinical Psychologist Jobs as per the DHFWS Rajasthan Recruitment 2017 advertisement published on department web portal. Job seekers who have required eligibility may apply through Offline Mode after reading all the details of DHFWS Rajasthan Recruitment 2017 through this section.You are needed to send the application form in the appropriate format at the below address till or before 10th March 2017. Education Needed : Candidates who are willing to apply for DHFWS Rajasthan jobs must posses 10th / 12th / Graduation Degree / Post Graduation Degree from any recognized board or institution. Those aspirants who are belonging to All Category & interested to apply for above posts they need to be paid Processing fee of 700/- (Post 1-4), 500/- (Post 5-9). The candidates who wish to apply for the available vacancy should not be more than 70 Years (Post 1), 45 Years (Post 3-4), 40 Years (Post 5,7-9), 35 Years (Post 6). Reserved category applicants will get the age relaxation as per DHFWS Rajasthan norms. Emoluments given to Employee: Contenders who will be appointed successfully for DHFWS Rajasthan Vacancy, they get the salary pay band of Rs. 70,000/- (Post 1), Rs. 30,000/- (Post 2), Rs. 25,000/- (Post 3,4), Rs. 18,000/- (Post 5), Rs. 20,000/- (Post 6), Rs. 8,000/- (Post 7-9). as per organization norms. Last Date to Submit Hard Copy of Application Form Is : 10-03-2017. Click Here For DHFWS Rajasthan Official Notification Link. Gujarat Cleaner Production Centre is ready to hire the applicants for the 06 available seats of Assistant Project Engineer Jobs as per the GCPC Recruitment 2017 advertisement published on department web portal. Job seekers who have required eligibility may apply after reading all the details of GCPC Recruitment 2017 through this section.Candidates who have decided to build their career in this organization they can attend Walkin Interview which are going to be held On 27th February 2017. Education Needed : Candidates who are willing to apply for GCPC jobs must posses B.E. / B.Tech (Chemical Engineering) / Engineering Degree from any recognized board or institution. Reserved category applicants will get the age relaxation as per GCPC norms. Emoluments given to Employee: Contenders who will be appointed successfully for GCPC Vacancy, they get the salary pay band of Rs. 16,000/- as per organization norms. Date of Interview : 27-02-2017. Click Here For GCPC Official Notification Link. District Disability Rehabilitation Centre Ujjain is ready to hire the applicants for the 13 available seats of Clerk, Janitor, Mobility Instructor Jobs as per the District Disability Rehabilitation Centre Ujjain Recruitment 2017 advertisement published on department web portal. Job seekers who have required eligibility may apply through Offline Mode after reading all the details of District Disability Rehabilitation Centre Ujjain Recruitment 2017 through this section.You are needed to send the application form in the appropriate format at the below address till or before With In 15 Day's. Education Needed : Candidates who are willing to apply for District Disability Rehabilitation Centre Ujjain jobs must posses 8th / 10th / 12th / ITI / Diploma / Graduation Degree / Post Graduation Degree from any recognized board or institution. Reserved category applicants will get the age relaxation as per District Disability Rehabilitation Centre Ujjain norms. Emoluments given to Employee: Contenders who will be appointed successfully for District Disability Rehabilitation Centre Ujjain Vacancy, they get the salary pay band of Rs. 20,000/- (Post 1-3,5), Rs. 16,000/- (Post 4,6,7,10), Rs. 14,000/- (Post 8), Rs. 12,000/- (Post 9,11), Rs. 7,000/- (Post 12), Rs. 8,000/- (Post 13). as per organization norms. The Last date For Acceptance of Application Forms : With In 15 Day's. Click Here For District Disability Rehabilitation Centre Ujjain Official Notification Link. Territorial Army is ready to hire the applicants for the 25 available seats of Soldier, Tailor, Housekeeper Jobs as per the Territorial Army Recruitment 2017 advertisement published on department web portal. Job seekers who have required eligibility may apply after reading all the details of Territorial Army Recruitment 2017 through this section.Candidates who have decided to build their career in this organization they can attend recruitment rally which are going to be held On 6th March 2017 - 11th March 2017. Education Needed : Candidates who are willing to apply for Territorial Army jobs must posses 10th / 12th from any recognized board or institution. The candidates who wish to apply for the available vacancy should be existing between 18 - 42 Years. Reserved category applicants will get the age relaxation as per Territorial Army norms. Selection of the job hunters will be done on the basis of their performance in the Physical Test, Medical Test, Personal Interview conducted by the selection committee. Date for the Recruitment Rally : 06-03-2017 - 11-03-2017. Tamilnadu Minerals Limited is ready to hire the applicants for the 14 available seats of Assistant Manager Jobs as per the Tamilnadu Minerals Limited Recruitment 2017 advertisement published on department web portal. Job seekers who have required eligibility may apply through Online Mode after reading all the details of Tamilnadu Minerals Limited Recruitment 2017 through this section.Candidates who meet the eligibility criteria and interested to apply they can submit their application form before the last date that is 10th March 2017. Education Needed : Candidates who are willing to apply for Tamilnadu Minerals Limited jobs must posses Engineering Degree / Post Graduation Degree from any recognized board or institution. Reserved category applicants will get the age relaxation as per Tamilnadu Minerals Limited norms. Emoluments given to Employee: Contenders who will be appointed successfully for Tamilnadu Minerals Limited Vacancy, they get the salary pay band of Rs. 9,300 - 34,800/- plus 4600/- Grade Pay as per organization norms. Online Registration of Application Form Is Starts From : 18-02-2017. Last Date of Online Application Is : 10-03-2017. 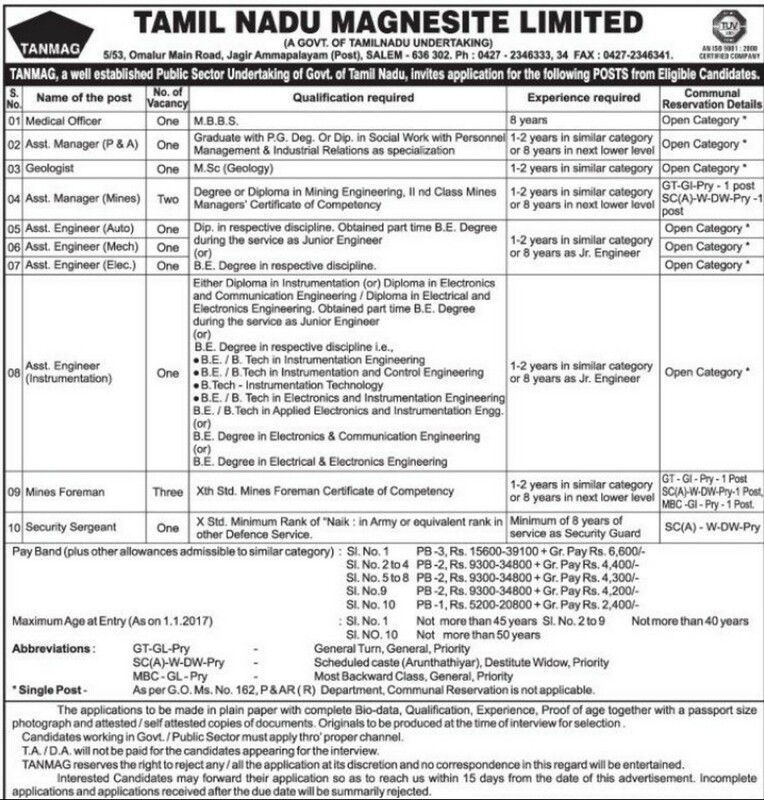 Click Here For Tamilnadu Minerals Limited Official Notification Link. Women and Child Development Department Korba is ready to hire the applicants for the 05 available seats of Centre Administrator, Case Worker Jobs as per the Women and Child Development Dept Korba Recruitment 2017 advertisement published on department web portal. Job seekers who have required eligibility may apply after reading all the details of Women and Child Development Dept Korba Recruitment 2017 through this section.Candidates who have decided to build their career in this organization they can attend Walkin Interview which are going to be held On 25th February 2017. Education Needed : Candidates who are willing to apply for Women and Child Development Dept Korba jobs must posses Graduation Degree / Post Graduation Degree from any recognized board or institution. The candidates who wish to apply for the available vacancy should not be more than 55 Years (Post 1), 45 Years (Post 2). Reserved category applicants will get the age relaxation as per Women and Child Development Dept Korba norms. Emoluments given to Employee: Contenders who will be appointed successfully for Women and Child Development Dept Korba Vacancy, they get the salary pay band of Rs. 25,000/- (Post 1), Rs. 15,000/- (Post 2). as per organization norms. Date of Interview : 25-02-2017. Click Here For Women and Child Development Dept Korba Official Notification Link. Sikkim University is ready to hire the applicants for the 85 available seats of Non Teaching & Teaching Posts Jobs as per the Sikkim University Recruitment 2017 advertisement published on department web portal. Job seekers who have required eligibility may apply through Online Mode after reading all the details of Sikkim University Recruitment 2017 through this section.Candidates who meet the eligibility criteria and interested to apply they can submit their application form before the last date that is 10th March 2017. Education Needed : Candidates who are willing to apply for Sikkim University jobs must posses Post Graduation Degree (library science / information science / documentation) from any recognized board or institution. The candidates who wish to apply for the available vacancy should not be more than 60 Years. Reserved category applicants will get the age relaxation as per Sikkim University norms. Emoluments given to Employee: Contenders who will be appointed successfully for Sikkim University Vacancy, they get the salary pay band of Rs. 37,400 - 67,000/- plus 10,000/8000/- Grade Pay as per organization norms. Online Registration Ends On : 10-03-2017. Closing Date to Submit Hard Copy of Application Form Is : 17-03-2017 (Librarian & Deputy Librarian). Click Here For Sikkim University Official Notification Link. Office Of The Superintendent is ready to hire the applicants for the 04 available seats of Staff Nurse Jobs as per the Superintendent Office Recruitment 2017 advertisement published on department web portal. Job seekers who have required eligibility may apply through Offline Mode after reading all the details of Superintendent Office Recruitment 2017 through this section.You are needed to send the application form in the appropriate format at the below address till or before 23rd February 2017. Education Needed : Candidates who are willing to apply for Superintendent Office jobs must posses 10th / 12th / Diploma from any recognized board or institution. The candidates who wish to apply for the available vacancy should be existing between 21 - 32 Years. Reserved category applicants will get the age relaxation as per Superintendent Office norms. Emoluments given to Employee: Contenders who will be appointed successfully for Superintendent Office Vacancy, they get the salary pay band of Rs. 11,700/-. as per organization norms. Last Date to Submit Hard Copy of Application Form Is : 23-02-2017. Click Here For Superintendent Office Official Notification Link.